This is the full glossary of terms as appears towards the back of the book, with the added benefit here of hyperlinking cross-references. You’ll also see a few arrows indicating links to external webpages on the entry in question. 1st / 2nd / 3rd / 4th / 5th / 6th flow – see Six Influence Flows. 4 models / the 4th model – describes four views of public relations as defined by James Grunig and Todd Hunt, the 4th being the one advocated by the Excellence study: the two-way symmetrical model. Accessible – easily understood or appreciated; friendly and easy to talk to; approachable. AVE – Advertising Value Equivalence; a discredited approach to gauging the value of public relations (or media relations more precisely). Balanced Scorecard – a BPM approach; a management system (not only a measurement system) that enables organizations to clarify their vision and strategy and translate them into action; provides a framework that not only provides performance measurements, but helps planners to identify what should be done and measured. BPM – Business Performance Management; the disciplined approach to management encompassing metric selection, measurement and organizational learning. Buyer marketing – individuals market their needs or desires, either directly or anonymously via a streams bank or other broker, to organizations interested in meeting that need or desire; also known as personal RFP (request for proposal). CCO – Chief Communications Officer, also known as Director of Public Relations or Director of Corporate Communications; more recently, also Chief Customer Officer and Chief Culture Officer. Chaos – a system exhibiting unpredictability. CInflO – Chief Influence Officer; runs the OIPM and takes an ‘integrator role’ in the OSM. CIO – Chief Information Officer. Citizen – a legally recognized subject or national of a state or commonwealth with rightful interest or concern in the workings of that nation or state. Client – a person or organization under the care of another. CMO – Chief Marketing Officer. Competitor – an organization with objectives that clash with our own either directly (e.g. fly with us not them) or indirectly (e.g. don’t fly, video conference instead). Complex / complexity – being intricate or complicated (also see Emergence). COO – Chief Operations Officer. CRM – Customer Relationship Management; managing an organization’s interactions with customers, clients and sales prospects. C-suite – the term given to the collection of C-titles, such as CEO, COO, CMO, etc. Customer – a person or organization that buys goods or services (where ‘buys’ includes paying with one’s attention or time; includes ‘consumer’). Customer perspective – one of four perspectives of the Balanced Scorecard addressing the question: To achieve our vision, how should we appear to our customers? CxO – A generic reference to any C-suite title. Data – discrete, objective facts, signals or symbols devoid of context and interpretation and therefore of no meaning or value. Digital detritus – the data each and every one of us kicks off as a product or by-product of our use of digital products and services. Emergence / emergent behaviour – a scientific term used to describe how very many relatively simple interactions can give rise to complex systems (i.e. systems that exhibit one or more properties as a whole that aren’t manifest for smaller parts or individual components). Employee – a person employed for wages or salary (taken to include their dependents, and also retired employees still financially reliant upon the organ- ization’s ongoing success). Engage – occupy or attract someone’s interest or attention; involve someone in a conversation or discussion (a measurable outcome of influence). Evaluation – the making of a judgement about the amount, number, or value of something. Excellence study – the most extensive study of public relations best practice to date. Financial perspective – one of four perspectives of the Balanced Scorecard addressing the question: To succeed financially, how should we appear to our shareholders? Focus on the influenced – a component of the influence-centric approach that advocates prioritizing investment of influence resources on those who have already been influenced as you’d intended, rather than those that haven’t yet. For-profit organization – primary motivation is to make and distribute surplus funds to owners. Human capital – skills, knowledge and values. Influence – you have been influenced when you think in a way you wouldn’t otherwise have thought or do something you wouldn’t otherwise have done. Influence-centric – an approach to influence with two foci: one on focusing on the influenced, and the other on tracing influence. Influence objective – each overarching organizational objective may demand a subset of influence objectives wholly necessary and sufficient in influence terms to accomplish the overarching objective. Influence performance management – the ease and effectiveness with which we can manage and learn from influence flows; integral to the process by which customers, citizens and all stakeholders interact with organizations and governments to broker mutually valuable, beneficial relationships; a reframing of marketing and PR for the 21st century. Influence professional – a member of the CInflO’s team, of the OIPM. Influence Scorecard – represents all the differentiated influence processes for incorporation into business performance management (BPM); the subset or view of the Balanced Scorecard (or equivalent) containing all the influence-related KPIs stripped of functional silo; helps to ensure that the full potential to influence and be influenced is exploited cohesively and consistently; the name for our influence framework here, our management approach to setting influence strategy within the purview of the Six Influence Flows and mapping influence strategy. Influence strategy – describes how an organization expects to influence and be influenced in ways that are wholly necessary and sufficient to the achievement of the influence objectives and successful execution of the overarching strategy; at once part of the overall organizational strategy (for what is an organizational strategy devoid of any aspect of influence?) and driven by it. Influencer-centric – an approach to influence that pivots around finding and influencing the so-called influencers or ‘influentials’; described by the author as an immature approach in comparison to influence-centricity. 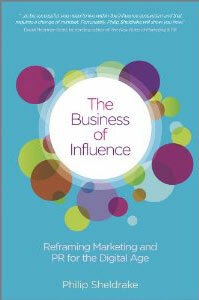 Influentials – a name given to select individuals regarded as having the power to influence many others; a focus of Malcolm Gladwell’s The Tipping Point and the title of a book by Jon Berry and Ed Keller. Information – the result of structuring or organizing data in such a way as to give it meaning and relevance for specific purpose or in a specific context. Information capital – systems, databases, networks. Interaction – reciprocal action or influence. Internal business processes perspective – one of four perspectives of the Balanced Scorecard addressing the question: To satisfy our shareholders and customers, what business processes must we excel at? Internet of Things – refers to a network of objects not historically connected: the device containing electronics in order to fulfil its primary function; the electrical device traditionally absent of sophisticated electronics; non-electrical objects; and environmental sensors. Knowledge – the result of structuring or organizing information in such a way that it helps to form a framework for the incorporation of further information and aids the evaluation of the world, accruing experience, expertise and know-how. KPI – Key Performance Indicator; a performance metric. Learning and growth perspective – one of four perspectives of the Balanced Scorecard addressing the question: To achieve our vision, how will we sustain our ability to change and improve? Left-brained – while emerging from scientific study of the brain, we use this term in its non-scientific generalization as meaning ‘having a bias towards logic, mathematics and science, detail orientation, systematic thinking’. Life stream – a term coined by Eric Freeman and David Gelernter at Yale University in the mid-1990s to describe ‘. . . a time-ordered stream of documents that functions as a diary of your electronic life; every document you create and every document other people send you is stored in your lifestream’. Linked data – a subtopic of the semantic Web that allows data to be described with reference to universally available common vocabularies. Marketing – the process by which companies create value for customers and build strong customer relationships in order to capture value from customers in return. Measurement – the action of measuring something; ascertaining the size, amount, or degree of something by using an instrument or device; assessing the importance, effect, or value of something. Metric – a system or standard of measurement; (in business) a set of figures or statistics that measure results. Mission – why an organization exists. Motivation – reason(s) for acting or behaving in a particular way. MyChannel – describes a scenario where every single person has her own unique ‘channel’ made up of her own subscriptions, her friends’ subscriptions and recommendations, and automated ‘if you like that, you’ll like this’ discovery. Netizens – a portmanteau of Internet and citizen; not ‘online publics’ in the normal ‘digital PR’ context, but people who respond to stimuli online. Non-profit organization – primary motivation is not financial but to achieve some other ends; has a controlling board rather than owners. OIPM – Office of influence performance management; run by the CInflO, taking responsibility for every aspect of the Six Influence Flows and the Influence Scorecard. Organization – an organized group of people with a particular purpose. Organization capital – culture, leadership, alignment, teamwork. OSM – Office of strategy management; a team specifically charged with executing the strategy processes; specifically in relation to strategy maps and the Balanced Scorecard. Partner – a person or organization of importance to an organization achieving its objectives (e.g. supplier, reseller, retailer). Privacy – the ability to determine for ourselves when, how, and to what extent information about us is communicated to others. Privacy dial – virtual instrumentation allowing easy selection of the privacy option required for a product or service, or group of products or services. Privacy framework – a simple, universal approach to allowing customers to manage their privacy preferences. Prospect – a person or organization regarded as a potential customer. Public organization – primary motivation set by the state and under the operational control of the state. Public relations – a management function that focuses on two-way communication and fostering of mutually beneficial relationships between an organization and its publics. Relationship – the way in which two or more people or things are connected, or the state of being connected. Relevance – closely connected or appropriate to the matter in hand. Reputation – the beliefs or opinions that are generally held about someone or something. Resonance – the power to evoke enduring images, memories, and emotions. RFID – Radio Frequency Identification; small tags that hold digital information about the item and can be read remotely, and are physically attached to the item in question and can be active (have a battery) but more often these days are passive (no battery). Right-brained – while emerging from scientific study of the brain, we use this term in its non-scientific generalization as meaning having a bias towards feelings, ‘big picture’ oriented, images, spatial perception. ROCI – Return on customer investment; a term invoked by Schultz and Schultz in describing integrated marketing communications. ROI – Return on investment; a financial calculation determining the likely or actual financial return expected from or delivered by a specific investment. SBU – Strategic business unit; a unit of the company that has a separate mission and objectives, and that can be planned and evaluated independently from the other parts of the company; an entity with one universal set of influence objectives. Semantic analysis – computationally trying to determine the meaning of language, of a corpus. Semantic Web – the Web as a universal medium for data, information and knowledge exchange; where the Web itself understands the meaning of all the content and participation (see also Linked Data). Sentiment analysis – a subtopic of semantic analysis; computationally trying to determine the author’s emotional regard for or attitude towards something from the text alone. SEO – Search engine optimization; the process of editing a webpage to help maximize its PageRank and similar quantifications of its relevance to particular search terms. Shareholder – an owner of shares in a for-profit organization (taken to include those with other financial holdings or investments contingent upon the organization’s financial success). Significance – the quality of being worthy of attention; importance. 6th flow – Stakeholders’ influence with our competition. Social media – media that isn’t traditional / ‘industrial’ / ‘mass’ media; facilitates social interaction. Social Web – consists of social media, applications, services and the network of devices. Social Web analytics – the application of search, indexing, semantic analysis and business intelligence technologies to the task of identifying, tracking, listening to and participating in the distributed conversations about a particular brand, product or issue, with emphasis on quantifying the trend in each conversation’s sentiment and influence. Stakeholder – a person or organization with an interest or concern in our organization or something our organization is involved in. Strategy – Michael Porter defines strategy to be about selecting the set of activities in which an organization will excel to create a sustainable difference in the marketplace, and thereby creating sustained value for its shareholders (or sustainable value in the case of non-profits). Strategy maps – a process developed by Kaplan and Norton; provides the visual framework for integrating the organization’s objectives in the four perspectives of a Balanced Scorecard; illustrates the cause-and-effect relationships that link desired outcomes in the customer and financial perspectives to outstanding performance in critical internal processes; and identifies the specific capabilities in the organization’s intangible assets that are required for delivering exceptional performance in the critical internal processes. Streams bank – the service with the primary purpose of collecting all your digital detritus, all your so-called life streams of data, in one place on your behalf and giving you the power to analyse and visualize it all; may offer additional services. Tracing influence – a component of the influence-centric approach that seeks to understand and learn from how influence has been exerted before; seeks to ‘close the loop’. Trust – firm belief in the reliability, truth, or ability of someone or something. Values – describes what’s important to an organization. Vision – describes what an organization wants to be. Web 1.0 – sometimes referred to as the transactional Web; dominated by read-only websites and ecommerce. Web 2.0 – the advent of the Web characterized by (user generated) content and community (social) participation (see also Social media). Web 3.0 – commonly taken to mean the semantic Web. Web of data – see also Semantic Web. Wisdom – my favourite definition of wisdom is the ability to make information super-useful; described as an amalgam of knowledge and judgement, resulting in ‘know-why’ in the form of ‘why do’ (rather than in the form of ‘why is’, which is information). Sure Deshawn. The license terms for the content here is stipulated in the footer below. Creative Commons Attribution-ShareAlike 3.0 Unported License, and click the link in the footer if you’re not clear what this means.